Nobody was interested in having dinner after having late lunch. Because of Ramadan Kareem fasting timings we are going through little bit of reshuffle in cooking schedule. So my son declared he will prefer smoothie and than daughter followed him too. Husband and me are silent and less fussy eaters. 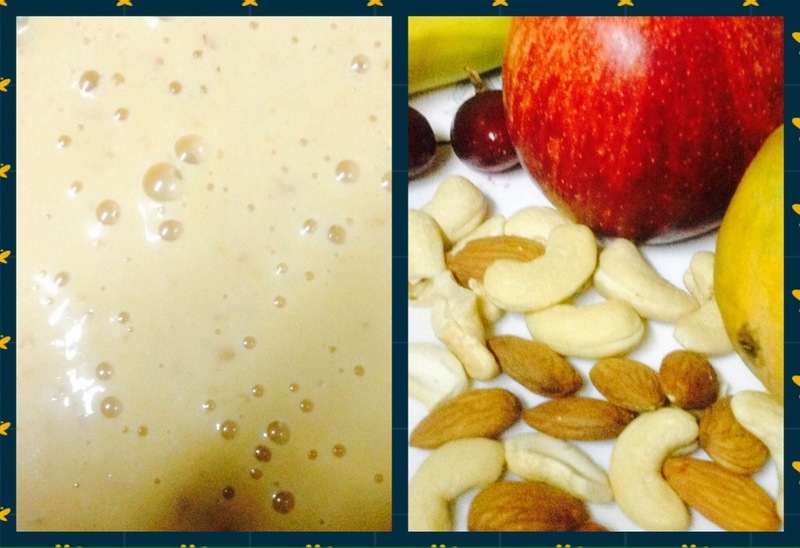 So I was in kitchen to create a dinner smoothie with all goodness of indirect dinner. My smoothie making means whatever is tasty n sweet in house, goes in blender.So after putting the blender pot on mixi, I started putting things in. Here is my super energizer smoothie with 11 ingredients. For Ramadan iftar or sehri you can make this and it will give you good quantity of energy. Now start blending it and give it 12-14 good blends. If possible serve immediately or if later than put the pot in fridge and before serving give one more blend in mixi.